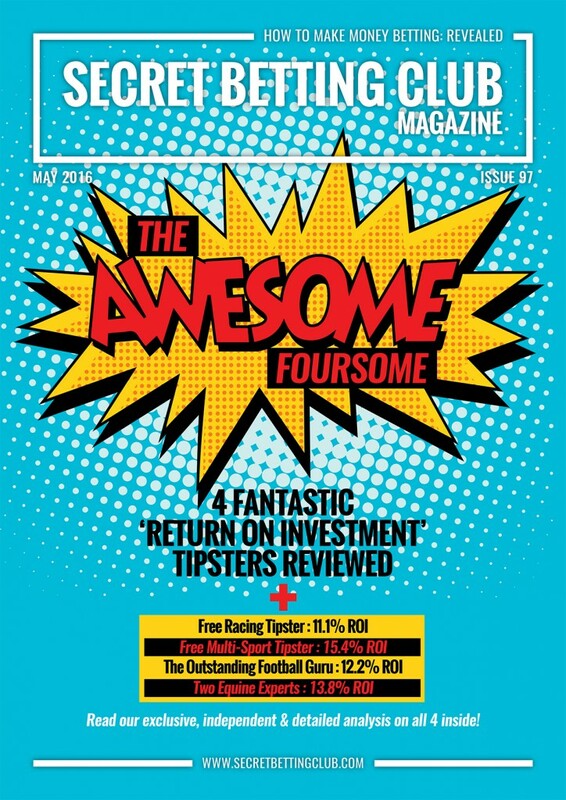 The very latest Smart Betting Club Magazine (Issue 97) is out now – featuring our rundown on an ‘Awesome Foursome‘ of tipsters under the review microscope. The Free Racing Tipster up 11.1% ROI & 140 points profit since 2013. Extremely easy to follow and from a proven winning expert. The Football Guru with 12.2% ROI from over 2000 bets in the last 2 seasons. Profitable in all 3 main markets: 1X2, Asian Handicap & Multiple bets. The Racing Tipster duo with an excellent track record: 13.8% ROI from 2306 bets and over 200% bank growth since 2014. This pair know how to make money on racing. The Free Golf, Racing & Football Tipster in profit to the tune of 15.4% ROI & exclusively available via the SBC Forum. Of the Awesome Foursome – two of the tipsters are totally free to follow, whereas the other two are offering exclusive discounts to SBC members only. You can save 35% on the cost of the football guru and £10 a month on the racing tipster duo. All as part of the major tipster savings we negotiate on your behalf! Alongside Issue 97 as a Gold or Platinum Smart Betting Club subscriber, you can also gain access to our 10 year back catalogue of expert tipster reviews, interviews and strategies. This includes every single tipster review we have ever written (there are literally hundreds available!) including all of the Hall of Fame Tipsters we recommend to make you money betting. All of which comes with a 90 day money back guarantee – so you can sign-up totally risk-free, with everything to gain and nothing to lose. Throughout May we are deducting £16 off the cost of ALL Smart Betting Club Memberships – Silver, Gold and Platinum, making it an ideal time to see just how we can help you make money betting. So if you have yet to try our service out, make sure you do this month and save £16 via this special offer. You can get started straight away with instant access to our service as soon as you sign-up. Subscribe Now & Save £16! This entry was posted in SBC Magazine. Bookmark the permalink.